Emily Koopmann, head of Civic Nebraska's Campbell Elementary Community Learning Center, shares how she and her staff build young civic leaders. A couple of months ago I posted about what Civic Nebraska means to me. In it, I divulged the not-so-secret aspect of my extreme extroversion and revealed my love and loyalty for North Central Lincoln. But, what are passions without progress? To make a written profession of love is one thing, but in my role as a School Community Coordinator, how does this love unfold, take root, and grow? The best way I can map this out is by using a tool created by the Nebraska Department of Education called “Intersection of the Six Tenets of AQuESTT and Nebraska 21st Century Community Learning Centers Program” (See more here). 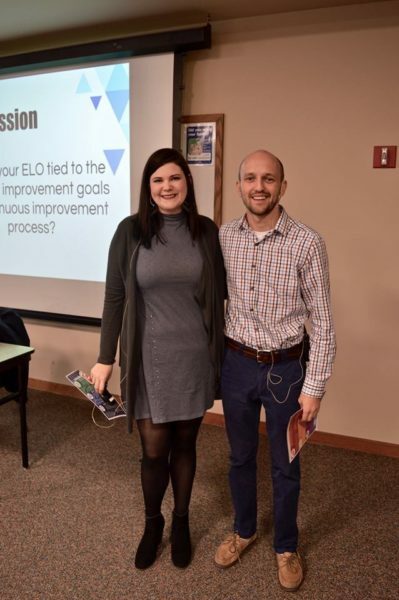 Lane Carr, the department’s Director of Accountability and AQuESTT, and I recently presented on this tool at the GetConnected 2018 Nebraska After School Conference and at a stakeholder meeting of the Lincoln Community Learning Centers. Ok now, after fancy jargon, hyperlinks, and introductions – now, let me tell you about the actions that illustrate our affections. The six tenets are broken into two categories: Teaching and Learning, and Student Success and Access. Under these two categories, here’s a glimpse into how this happens through Civic Nebraska’s CLC partnership at Campbell Elementary School. We are lucky to have outstanding partnerships with both the University of Nebraska’s Honors Program and the university’s Department of Computer Science and Engineering, both which run clubs during our after-school program. We also prepare students in small ways, like allowing student council to lead a piece of our school assemblies, encouraging students to speak in front of the school board, and showcasing them at Civic Nebraska’s annual Strengthening Democracy Awards. Collaboration is key at Campbell. Data and goals are shared both ways and are utilized in a way that makes us a community school. The CLC is tasked with certain goals on the Campbell School Improvement Plan; everyone, including CLC part-time staff, are expected to think through how to embed these improvements during program time. Whether through formal climate surveys and 21st-century snapshots, or informal conversations at parent-teacher conferences, we are available to listen and ready to improve. Giving part-time staff the time, space, and financial support to learn is huge. Early in the year my principal and I sat down and created professional development opportunities based on our School Improvement Plan goals, and school community feedback. In the coming semester, we will have one big CLC team meeting focused on the culture and mission of our group and then are offering PD on topics like conflict management, lesson planning, and trauma-informed care. If staff are unable to attend two of these in a semester they are required to shadow a classroom teacher. Our CLC team aims to be around every table and at every event. I attend Campbell team meetings, community and school organization meetings, and create gatherings with local agencies, elected officials, and community partners. CLC staff live in the neighborhood and help at school food markets or family nights; we engage during more than just the before- and after-school hours. The after-school clubs we offer come from a variety of sources: parent and student feedback, community offers, or discussion on school improvement. Currently, we are focusing much of our attention on Extended Day Academic Support. This opportunity is plainly called Reading Club and specific students have been invited to participate based on our School Improvement Plan goal to increase fluency. Certified teachers are serving over 40 students per day in Reading Club and we as a CLC have made this Campbell initiative possible by streamlining the registration with other clubs and by absorbing these students into the broader arrival, snack, and dismissal procedures of our after-school programming. This is my favorite tenet — which is why I saved it for last. Each aspect of the good work Campbell CLC accomplishes is due in credit to our team of part-time staff. We have 16 people on the Campbell CLC team; 11 of them are returners from the 2017-18 school year. I cannot speak enough on the positive impact this has on our team culture, on community trust level and accountability, and on our biggest mission – student relationships. CLC partnered with United Way and Campbell’s Kindergarten Jump Start in summer 2018; summer 2019 will be our first summer of full-day programming. As in my first post earlier this year, I have to emphasize that the people I interact with through this community work are what motivate me for another day. But there are details behind the desire: at the Campbell CLC we think critically as we model engagement and learning. Civic Nebraska means to me that I am not only a strategizer but a laborer. We see the bigger picture over all else — it’s our overarching inspiration. But in our day-to-day work, we know how to dig in, plant seeds, and meticulously care for what we’re trying to grow.